For the Roman goddess, see Venus (mythology). Of softened radiance with her dewy locks. And shuts the gates of day. - Anna Letitia Barbauld. And shuts the gates of day. Anna Letitia Barbauld in “A Summer Evening's Meditation: in: A library of poetry and song: being choice selections from the best poets, J.B. Ford and Company, 1872, p. 315. The star [Tycho's supernova] was at first like Venus and Jupiter, giving pleasing effects; but as it then became like Mars, there will next come a period of wars, seditions, captivity and death of princes, and destruction of cities, together with dryness and fiery meteors in the air, pestilence, and venomous snakes. Lastly, the star became like Saturn, and there will finally come a time of want, death, imprisonment and all sorts of sad things. Tycho Brahe in: Patrick Moore's Data Book of Astronomy, Cambridge University Press, 10 Febrauary 2011, p. 336. The universe is globe-shaped, either because that is the most perfect shape of all, needing no joint, an integral whole; or because that is the most capacious of shapes, which is most fitting because it is to contain and preserve all...The first and highest of all is the sphere of the fixed stars, which contains itself and all things, and is therefore motionless. It is the location of the universe, to which the motion and position of all the remaining stars is referred.... - Nicolaus Copernicus. Nicolaus Copernicus on the Revolution of the Heavenly Spheres quoted in: Károly Simonyi A Cultural History of Physics, CRC Press, 25 January 2012, p. 180. Nicolaus Copernicus quoted in: Edwin Arthur Burtt The Metaphysical Foundations of Modern Physical Science: A Historical and Critical Essay, Routledge, Jun 23, 2014, p. 45. ...The eight (formerly nine) recognized planets that orbit the Sun are, in order of increasing distance, Mercury, Venus, Earth, Mars, Jupiter, Saturn, Uranus, and Neptune. The first four are called terrestrial planets and the next four giant, or Jovian, planets. - Merriam Webster Dictionary. Merriam Webster Dictionary in: planet, merriam-webster.com. Timothy Ferris in:Seeing in the Dark: How Amateur Astronomers Are Discovering the Wonders of the Universe, Simon and Schuster, Jul 8, 2003 , p, 206. The orbit of the earth is a circle; round the spheres to which this circle belongs describe a dodecahedron; the spheres including this will give the orbit of Mars. Round Mars describe a tetrahedron; the circle including this will be orbit of Jupiter. Describe a cube round Jupiter’s orbit; the circle including this will be Saturn. Now, inscribe in the earth’s orbit, an icosahedron, the circle inscribed in it will be the orbit of Venus: inscribe an octahedron in the orbit of Venus: the circle inscribed in it will be Mercury’s orbit. This is the reason of number of planets.- Kepler. Galileo Galilei in: Galileo Galilei, Lucent Books, 1 September 1992, p. 30. Galileo Galilei in: Kate Aughterson The English Renaissance: An Anthology of Sources and Document, Routledge, Jun 1, 2002, p. 383. Counting stars by candle light all are dim but one is bright the spiral light of Venus rising first and shining best, from the northwest corner of a brand new crescent Moon crickets and cicadas sing a rare and different tune. Robert Hunter in Terrapin Station quoted in : David Harry Grinspoon Venus Revealed: A New Look Below the Clouds of Our Mysterious Twin Planet, Basic Books, 1998, p. 84. Mehmet Murat ildan from the play Galileo Galilei (2001) quoted in: Venus Transit Tue June 5 - Get Ready, Daikly Kos, 29 May 2012. Sir James H. Jeans in: Physics and Philosophy, Courier Dover Publications, 16 July 2012, p. 156. The orbit of the earth is a circle; round the spheres to which this circle belongs describe a dodecahedron; the spheres including this will give the orbit of Mars. Round Mars describe a tetrahedron; the circle including this will be orbit of Jupiter. Describe a cube round Jupiter’s orbit; the circle including this will be Saturn. Now, inscribe in the earth’s orbit, an icosahedron, the circle inscribed in it will be the orbit of Venus: inscribe an octahedron in the orbit of Venus: the circle inscribed in it will be Mercury’s orbit. This is the reason of number of planets. Kepler in his first published work Mysterium Cosmographicum (1597) quoted in: Concepts in Physical Science, Education Resources Information Center (eric.ed.gov), p. 11. Nicholas Kurti in: Harold McGee On Food and Cooking: The Science and Lore of the Kitchen, Simon and Schuster, 20 March 2007, p. 2. ...Neither Venus nor Mars has such a magnetic field, although the two planets are similar to Earth in many other ways. Plato in: The Observatory, Volume 27, Editors of the Observatory, 1904, p. 364. 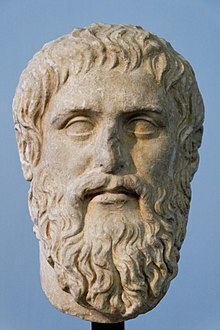 The Greek philosopher, Plato, in the fourth century B.C. asked his students if they could devise a theory or explanation to explain this erratic planetary motion using some form of circular motion. 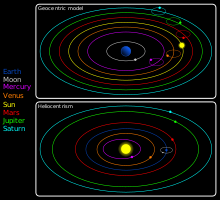 Being keen observers, the Greeks came up with the most logical and obvious conclusions; namely, that the earth was the center about which the sun, the moon, planets, and the stars rotated. 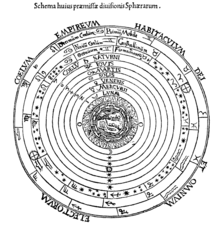 This model of the universe is called a geocentric or earth-centered model. It satisfactorily explained the daily motion of the stars and sun by assuming that they were attached to invisible crystalline spheres that rotated about the earth. The axis of the sphere of the sun was tilted with respect to that of the stars to account for the variation of the sun's height at zenith with the various seasons. Since the sun appears to move through the stars and was brighter, it was assumed to be nearer to the earth than the stars. 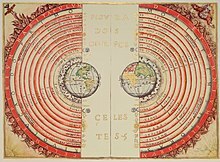 The spheres of the Moon, Mercury, and Venus were placed within the sphere of the sun while those of Mars, Jupiter, and Saturn were placed outside the sphere of the sun but within the sphere of the stars. Quoted by O.P.Puri in: "Concepts in Physical Science", p. 7. Even the goddess herself is dissected : Chemistry dissolves the goddess in the alembic, Venus the white queen, the universal matrix, Down to molecular hexagons and carbon-chains. Kathleen Jessie Raine in the Collected Poems of Kathleen Jessie Raine quoted in : Carl C. Gaither, Gaither's Dictionary of Scientific Quotations, Springer Science & Business Media, 5 January 2012, p. 394. Some scientists believe that until about 500 million years ago the Venus surface was almost entirely devoid of landforms. Streams and oceans of molten rock were relentlessly pouring out of the interior filling in and covering over any relief that had managed to form. - Carl Sagan, Ann Druyan. The Venus transit is not a spectacle the way a total solar eclipse is a spectacle. - Neil deGrasse Tyson. Some scientists believe that until about 500 million years ago the Venus surface was almost entirely devoid of landforms. Streams and oceans of molten rock were relentlessly pouring out of the interior filling in and covering over any relief that had managed to form. Carl Sagan,Ann Druyan in Pale Blue Dot: A Vision of the Human Future in Space, Random House Publishing Group, Jul 6, 2011, p. 183. Venus has about 90 times more air than Earth. It isn't mainly oxygen and nitrogen as here—it's carbon dioxide. But carbon dioxide doesn't absorb visible light either. What would the sky look like from the surface of Venus if Venus had no clouds? With so much atmosphere in the way, not only are violet and blue waves scattered, but all other colours as well - green, yellow, orange, red. The air is so thick, though, that hardly any blue light makes it to the ground; it’s scattered back to space by successive bounces higher up. Thus the light that does reach the ground should be strongly reddened – like an Earth sunset all over the sky. Further sulfur in the high clouds will strain the sky yellow. Pictures taken by the Soviet Venera landers confirm that the skies of Venus are a kind of yellow-orange. Carl Sagan, Ann Druyan in "Pale Blue Dot: A Vision of the Human Future in Space" p. 155. Those who are skeptical about carbon dioxide greenhouse warming might profitably note the massive greenhouse effect on Venus. No one proposes that Venus's greenhouse effect derives from imprudent Venusians who burned too much coal, drove fuel-inefficient autos, and cut down their forests. Carl Sagan,Ann Druyan in "Pale Blue Dot: A Vision of the Human Future in Space" p. 205. Sarah Williams in: Twilight Hours: A Legacy of Verse, Strahan, 1868, p. 71. To be sure, we do not have no absolute proof that Mars is inhabited [...] Personally, I have my faith on the feeble planetary electrical disturbances which I discovered in the summer of 1899, and which according to my investigations, could not have originated from the Sun, the Moon, or Venus. Further study since has satisfied me they must have emanated from Mars. Nikola Tesla (1909) in:Electrical Signals of Primary Origin, teslasociety.com. During my experiments here [Colorodo Springs 1899] Mars was at a relatively small distance from us, and in that dry and rarified air, Venus appeared as large and bright that it might have been mistaken for one of those military signaling lights...I came to the conclusion that Mars was sufficient to exert a noticeable influence on a delicate receiver of the kind I was perfecting...my ear barely caught signals coming in regular succession which could not have been produced on earth, caused by any solar or lunar action or by the influence of Venus, and the possibility that they might have come from Mars flashed upon my mind. Nikola Tesla recounting his experiences in 1899 with the electrical disturbances he had received in: "Electrical Signals of Primary Origin". Neil deGrasse Tyson in: Megan Gannon Astrophysicist Neil deGrasse Tyson, Seth MacFarlane Talk 'Cosmos' with GQ, The Space, 6 March 2014. Neil deGrasse Tyson in: Emi Kolawole Neil deGrasse Tyson on the Venus transit: It’s not about the ‘spectacle’, Washington Post, 5 June 2012. Deserts are not confined to earth. The atmospheric circulation patterns of other terrestrial planets with gaseous envelopes also depend on the rotation of those planets, the tilts of their axes, their distances from the Sun and the composition and density of their atmospheres. Except for the poles the entire surface of Mars is a desert. Venus may also support deserts. A.S. Walker, in Deserts:Geology and Resources, U.S. Department of the Interior/U.S. Geological Survey, p. 11. ... A knowledge of close coincidence between the cycles of Venus and human pregnancy may have contributed to the persistent, but nonexclusive of female characteristic to Venus. Western attributes The Venus de Milo and Botticelli's birth of Venus (popularly known as Venus on the Half Shell) are icons of this imagery in Western culture. ...The planet is completely shrouded in clouds that reflect nearly 80 percent of the Sun’s light back into space, making Venus the brightest of worlds. For me Venus holds special fascination because of it many close connections to Earth, and the important role it has played in our changing ideas about the universe and our place in it. It is brightest thing in our night sky, after the full moon, and has long attracted human worship, fear, and calculation. A slightly twin to our planet in size and weight, Venus ( as we have learnt recently) is also currently active planet with a churning interior, young surface and continually recycling atmosphere. It is in many ways the most Earth like of other planets and a natural laboratory for studying some of the most crucial environmental tests facing us. You can feel when you are locked in resonance in a circle of drummers playing parts complimentary to yours. Venus and Earth have been locked in this same way, beating five against eight, for billions of years. There is no accepted physical explanation for the Venus-Earth five/eight polyrhythm. Some regard it as merely a coincidence, noting that the correspondence is not exact (it is actually off by two days of 2,820). But I suspect that this close rhythmic connection between the orbits of Venus and Earth goes back to the time when the planets were being formed from collisions between smaller “planetesimals”. On the noted aspect of music in planetary orbits in: p. 11. The great beauty and striking presence of Venus led to an association by the Greeks with Aphrodite, goddess of beauty and love. Inanna, Ishtar, Astarte and Venus are other names given to variations of this goddess in Western history, all associated with the planet. A knowledge of close coincidence between the cycles of Venus and human pregnancy may have contributed to the persistent, but nonexclusive of female characteristic to Venus. Western attributes The Venus de Milo and Botticelli's birth of Venus (popularly known as Venus on the Half Shell) are icons of this imagery in Western culture. Nowhere in recorded history has an awareness of the short-and long-term Earth-sky polyrhythrns been as advanced and integrated into cultural life as in the knowledge and beliefs of the ancient Mesoamericans, and in particular the classic Maya of Central America, who flourished between AD 300 and 900. Maya felt that we owed our existence to Venus who they called Kukulcan and their astronomer-priests repaid the debt with the blood of human sacrifice. Unfortunately, almost everything we know about the Maya’s sophisticated and complex system of Venus observations/ computations/prediction/worship comes from only four books that escaped the book-burning frenzy of the invading Christians. Included in this meticulously painted bark paper books is an abundance of astronomical information, including table of solar and lunar motions and table of Venus ephemeris, or table of motions, which is accurate for over a hundred years. The entire Mayan calendar, as were those of all Mesoamerican civilizations, was based on the 260-days Venus appearance interval. The 260-day Mayan calendar is still in use today in many areas of Guatemala. The 260-day Venus interval and the 365-day year come into phase every 18,980 days, or 53 years. But first let's trace the origin and history of the popular vision of Venus as Earth's soggy twin. The striking brilliance that makes Venus such a noticeable presence in our sky results paradoxically from the same feature that long kept her cloaked in mystery. The planet is completely shrouded in clouds that reflect nearly 80 percent of the Sun’s light back into space, making Venus the brightest of worlds. Venus, all you need to do is identify some feature or mark and note the time it takes to reappear, as it rotates around the globe. Beginning in 1666, Cassini made the first attempt to do this. He found a rotation period of 23 hours and 21 minutes. In 1789, Schroder refined this estimate to 23 hours , 21 minutes, and 19 seconds. For Venus is (as was well known by early telescopic observers) literally right next door. The closest planet to Earth, at every inferior conjunction she swings to within one hundred times the Moon's distance. In 1956, passive radio observations had allowed a startling discovery that led to the first serious challenge to the fantasies of a warm, wet Venus. Mysteriously, the planet was emitting very large amounts of microwave radiation. Further observations in the 1960s confirmed its brightness when viewed with microwave eyes. 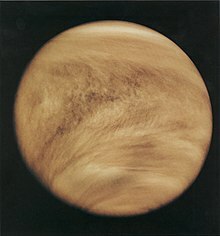 As long as Venus remained an object of distant observation in our sky, there was no way to be sure, and science fiction writers were free to populate Venus with ocean-dwelling beasts and evil dictators (news of the problematical microwaves was first published the same year that Zsa Zsa was thrilling audiences with her Venusian antics). We had to go there to demand some answers. This is where the rockets enter the story... the cold-war “space race” was on, science was along for the ride, onward to the planets. Venus was the target for the first spacecraft sent from Earth to another planet, Mariner 2 was launched on August 27, 1962. On Earth, only dust and pebbles get snuffed (making "shooting stars"), but on Venus you don't get any craters smaller than about two miles across. We expected this. In fact, the small size cutoff of craters conforms so closely to pre-Magellan predictions that it was a confidence booster for our models of the passage of small bodies through planetary atmospheres. Artist's depiction of Magellan at Venus. - We are just starting to think about how similar feed backs between the surface and atmosphere may be affecting the climate on Venus. Although the Magellan mission was mostly about the surface, it has caused us to rethink much of what we thought we knew about the atmosphere. ...throughout the 60s, 70s, and 80s our understanding of Venus slowly increased in depth and sophistication. But still the clouds did not clear, and major mysteries remained. The early Soviet efforts produced a string of failures...[[w:Venera 3|Venera 3 –actually reached Venus only to crash into the planet on March 1, 1966... the first successful mission Venera 4, reached Venus in October 1967 ---first planetary probe to enter the atmosphere of another planet, do direct experiments and radio home the results...During its brief (ninety-four –minute) decent by parachute, the spacecraft measured conditions in and below the clouds, confirming that the atmosphere of Venus is mostly carbon dioxide and recording increasing temperatures and pressure... at an altitude of more than sixteen miles. But on Venus you can't tell, so the hypothesis is consistent with the way all the craters sit atop the "paint job" of planet wide lava flows. Unfortunately, this scenario is only slightly more plausible than crater-worshiping. Venus should have a similar overall heat production, and it has to be losing this heat somehow. It can't be holding it inside because the whole planet would just be molten. It is not enough to simply pronounce that Venus looks different from Earth so it does not have plate tectonics. We have to find some cooling mechanism. We are just starting to think about how similar feed backs between the surface and atmosphere may be affecting the climate on Venus. Although the Magellan mission was mostly about the surface, it has caused us to rethink much of what we thought we knew about the atmosphere. Mars is the most Earthlike of the other planets in its surface conditions, but Venus may be the most Earthlike in its activity. All three planets started out young and restless, with warm, churning interiors and water flowing on their surfaces. But they have gone their separate ways. Mars cooled off...Venus, too, lost its ocean, but it retains an active churning interior and a surface that has been reworked many times by processes that are apparently still ongoing. This page was last edited on 4 June 2017, at 00:29.